I seem to remember a recent prompt to be inspired by being organised or something similar (WM#280 - be inspired by priorities) and it would appear that this is seriously lacking in my life! But my days are full and we have been busy hanging out with family and friends so I think that's important and a good reason to be late and feeling a bit behind schedule. And the busy times are not over so we will have to see how things go over the next weeks. We try to find films she hasn't seen before and settled on the Oz the Great and Powerful - the more modern retelling of the older Wizard of Oz story. Personally, I prefer the technicolour original with Dorothy and Toto but I liked this one more on this second viewing than I had originally. The special effects are gloriously colourful and whimsical, and the overall feel of the film is quite dreamy. What was rather missing for me in this version, apart from the ruby slippers, was the infamous yellow brick road. There is it in the film but there's no real mention of it in the story line - which made me a bit sad. 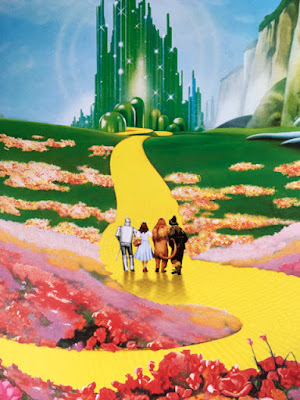 So this week in honour of the original, I'd like you to be inspired by the yellow brick road. You could have a story about seeing a version of the film, or maybe the stage version of Wicked - the prequel story of sorts. Judy Garland might be your role model or do you have a story about performing in a school or amateur dramatics stage performance of the story? Have you followed your own YBR in real life, or you could talk about the friends you've met along your own road of life. Of course, there's an Elton John song, "Goodbye Yellow Brick Road" which could be more your thing. What about having a road on your layout as a design feature or using some themed product - I'm sure I have a Graphic 45 paper featuring Dorothy and this has given me an idea for a layout I might make! I hope you can see that there are different ways to take this prompt and I'd love to see where it takes you. I hope you'll show us by adding your creations to our Facebook group here - we love it when you share so please don't be shy! Tag your entry with #WMXX so we know exactly which inspiration you've taken.